What a trip!! From the views of the flight into Paro you can appreciate the breathtaking terrain that you will be experiencing over the next 12 days in this magical kingdom, something that most people will never experience in their lives. 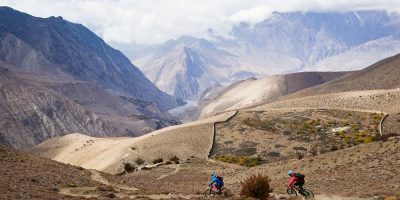 This customised cycling journey has been designed to show you the essential Bhutan – from the best vantage point… on two wheels, under your own steam. Bhutan has an amazing east-west road through the ‘middle hills’ and valleys, which not only offers amazing cycling, but also takes you into the heart of Bhutan. Along the way we make sure to stop and visit the villages, museums, monasteries, temples and of course to take in the incredible views to showcase the truly unique place that Bhutan is. 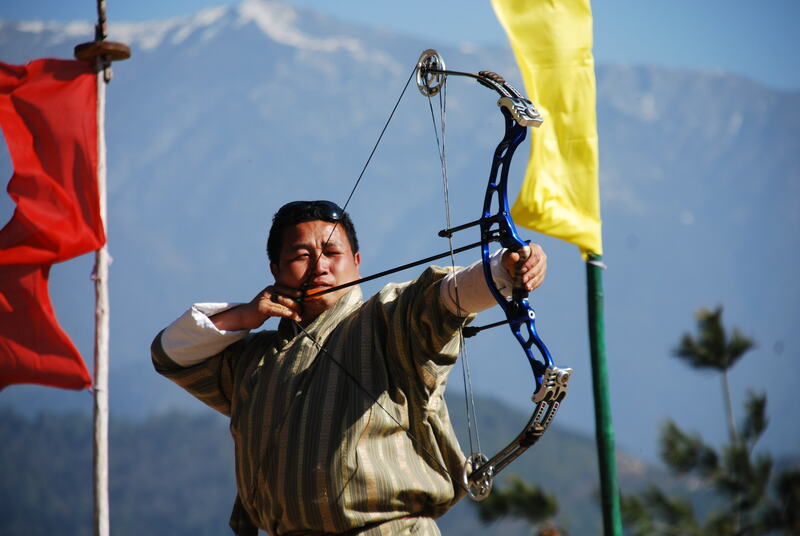 Your spectacular flight into Paro is a great introduction to beautiful Bhutan – you may have breathtaking views of Mount Everest, Kanchenjunga and many more Himalayan peaks including the sacred Jhomolhari and Mt Jichu Drake in Bhutan. 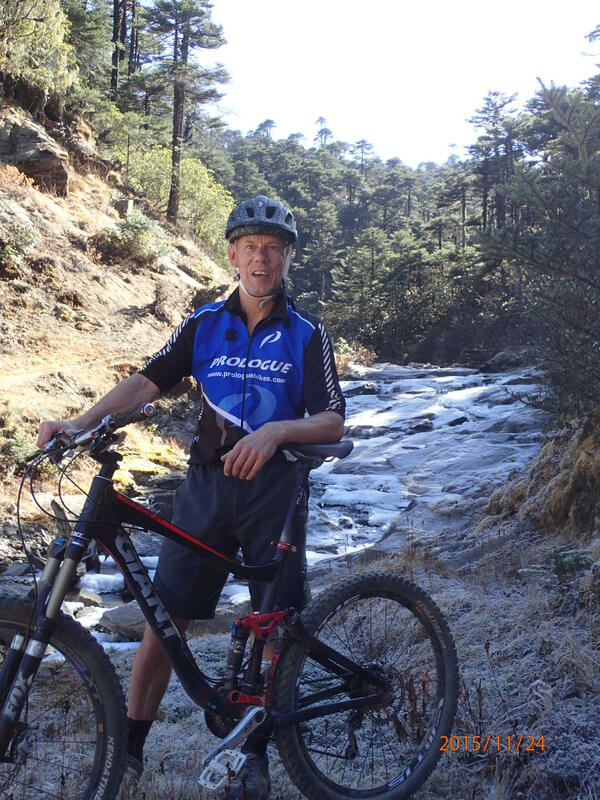 Your guide, who will be with you for the entire ride across Bhutan, will meet you on arrival at Paro. We visit Paro on our way back through after our ride but for now we drive to Thimphu, the capital city of Bhutan. We have some time in the afternoon to look around Thimphu and the options include sightseeing around the town to learn about the fascinating design, architecture and history of Bhutanese towns, as well conservation work going on in Bhutan. Or you can take a cycle up the valley to Takin Sanctuary to see the Takin (national animal) and to the viewpoint of Thimphu to enjoy the view of Thimphu city. There’s also the Zilukha Nunnery, Folk Heritage Museum and Textile museum. After breakfast, we hit the road for real, commencing our journey into the east of this fascinating country. Our first pass is the Dochu La (la means pass) at approx. 3050m altitude. 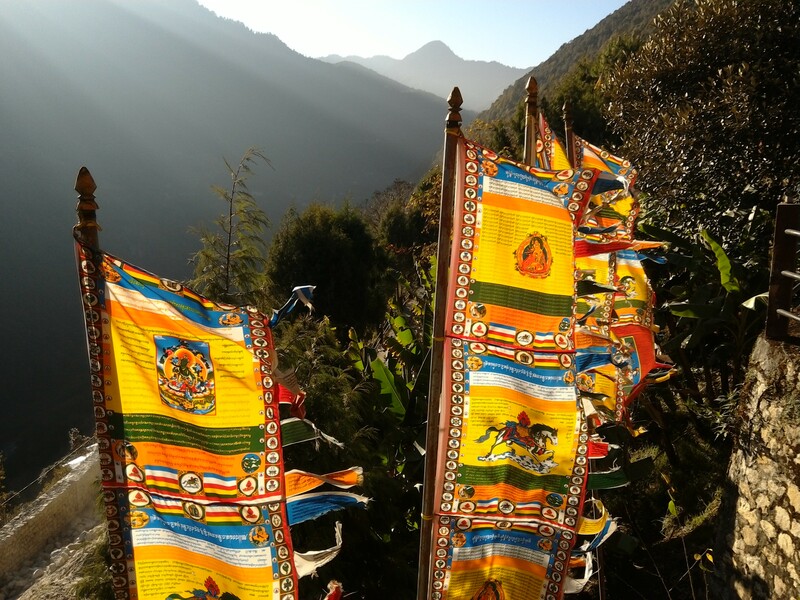 We will stop for a welcome cup of tea at the pass amid swarms of beautiful prayer flags fluttering in the winds, sending out prayers for the wellbeing of all sentient beings. 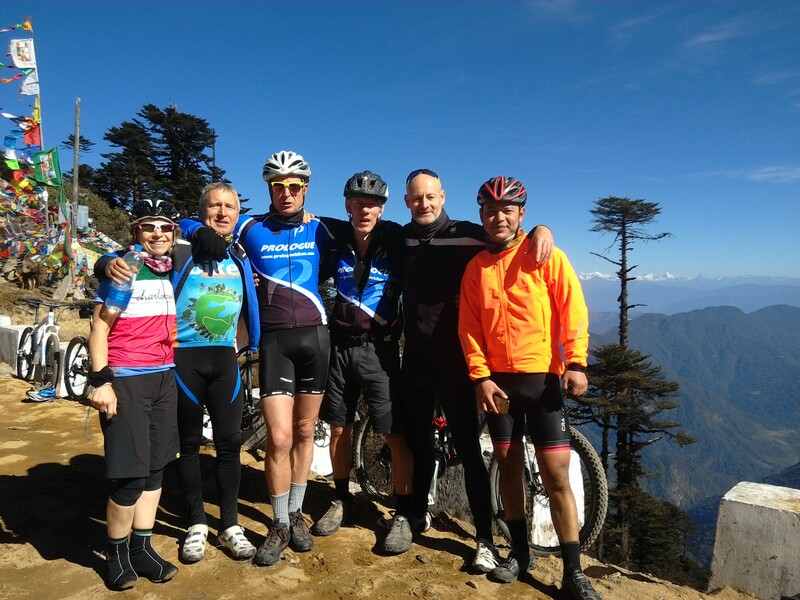 While we enjoy our tea we can take in the stunning vista of the Himalayan Range (weather permitting), which has unfolded before us as we slowly cycled up to the pass. We then descend to Mitsena where we turn off the main road, now heading north and down into the sub-tropical Punakha Valley. Arriving in Punakha (approx 1310m), the ancient capital of Bhutan, we will check in to our hotel and if time and energy levels permit, we can visit the Punakha Dzong (fort) built in 17th Century. The Dzong was built in 1637 by Shabdrung Ngawang Namgyal and is situated at the holy confluence of the Pho Chu (Male River) and Mo Chu (Female River). 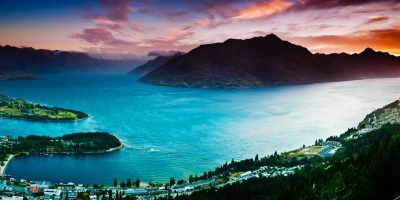 It has been destroyed by four fires, an earthquake in 1897 and has frequently been devastated by flood water coming from the great northern glaciers! However, the Dzong has now been fully restored to its original splendour. It has been an important site with the first temples built here in 1328. The mummified body of the Shabdrung is preserved here and Bhutan’s first king was crowned here. For many years it served as the seat of the Government and, even after moving to Thimphu, the government used it as their winter seat, due to the warmer climate. It is still the winter residence of Je-Khenpo (the spiritual leader of Bhutan). After a hearty breakfast we set out for Gangtey via Wangduephrodang, with the option of a few side trips on the way. 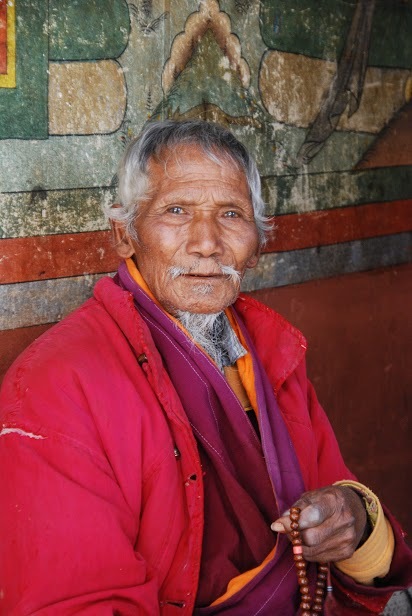 Our first is a short hike to the Chimi Lhakhang, a temple dedicated to the famous ‘Divine Madman’ and also known as ‘the Temple of Fertility’. This temple was built by Lama Drukpa Kuenley (also known as the Divine Madman for his odd ways) in the 15th century who subdued a demoness with a magical thunderbolt and made her the protective deity of the temple. 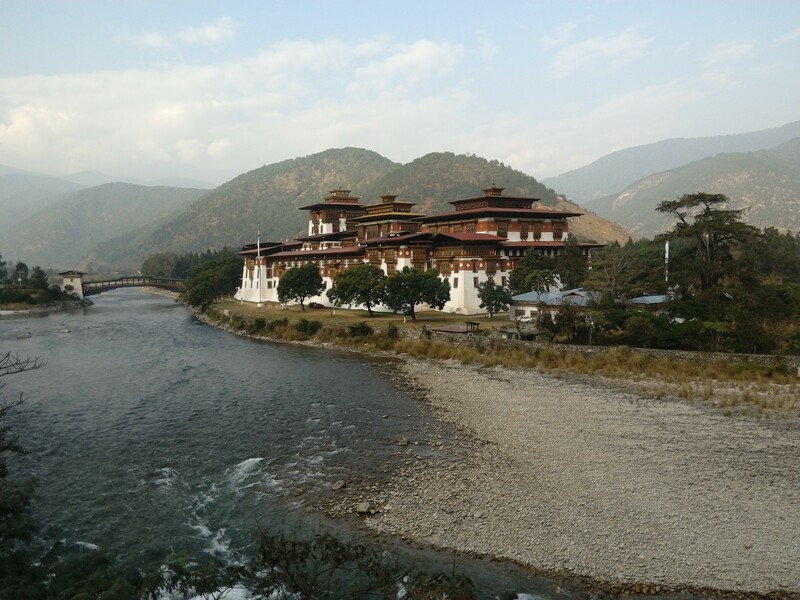 Heading into Wangduephrodang, the last town before entering central Bhutan and which played a vital role in unifying the districts of Bhutan, we will see the stunning Wangduephodrang Dzong. Continuing on from “Wangdi” we cross a mountain pass and ride into Gangtey, having gained about 1800m. In the afternoon we can have an excursion to the Phobjikha Valley, famous for sheltering the rare Black Necked Cranes. The cranes, usually in a flock of up to 200 birds, migrate from northern Tibet to winter here. As we have been cycling through beautiful rhododendron forest on most of our travels, the contrast of descending into the unique open marshlands of the valley is striking. After a hearty breakfast we proceed to the Central Bhutanese town of Trongsa crossing the Pele La at approximately 3420 m. We then descend on this spectacular road to Chendebji at approximately 2400m, a great downhill! After a rest at Chendebji we continue on into Trongsa (approx 2180m) and visit the Trongsa Dzong, built in 1644, is the ancestral home of the present Royal Family. Built on a mountain spur high above the gorges of the Mangde Chhu (river), the dzong controlled east-west trade for centuries. Not to be missed is the Tower of Trongsa, a modern art gallery and museum, housing the royal art collection and many other artefacts. 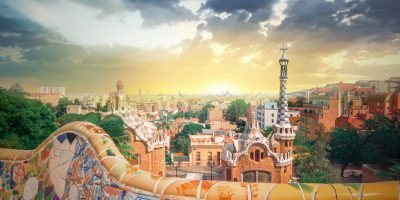 The Tower is well worth a look, with an impressive collection of statues, manuscripts, royal belongings and some antiquities including medals, swords and textiles. The Tower itself was renovated and opened in its current state in 2008, thanks to funding from Austria. 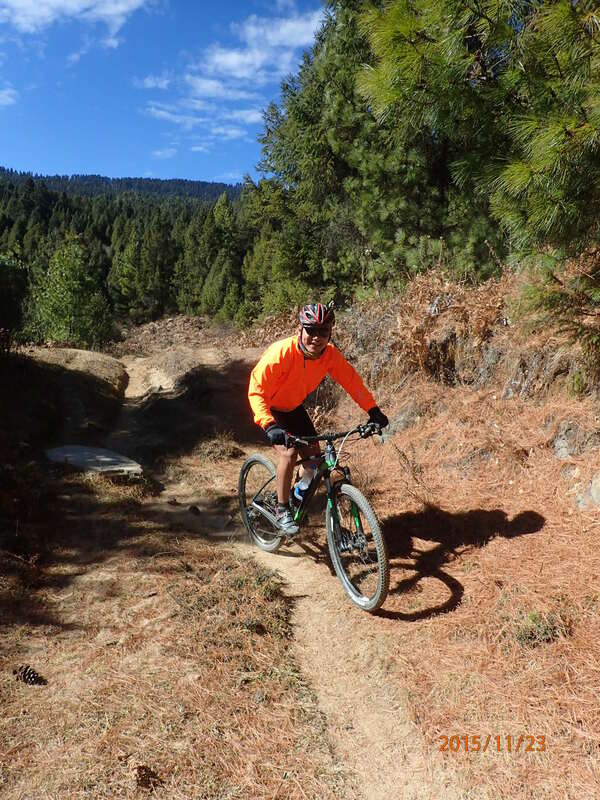 Today we have a great ride, firstly on a dramatic road through forest and over a great mountain pass before the scenery changes to the gentle spruce and fir covered slopes of the Bumthang region. But first, after breakfast, we have the option to visit the Ta Dzong before we leave town. The Ta Dzong, like the one we saw in Paro, is an ancient watch tower, built high up the mountainside to protect the dzong from enemies. It has unusual architecture, with two aisles protruding from the main building, something not found elsewhere. 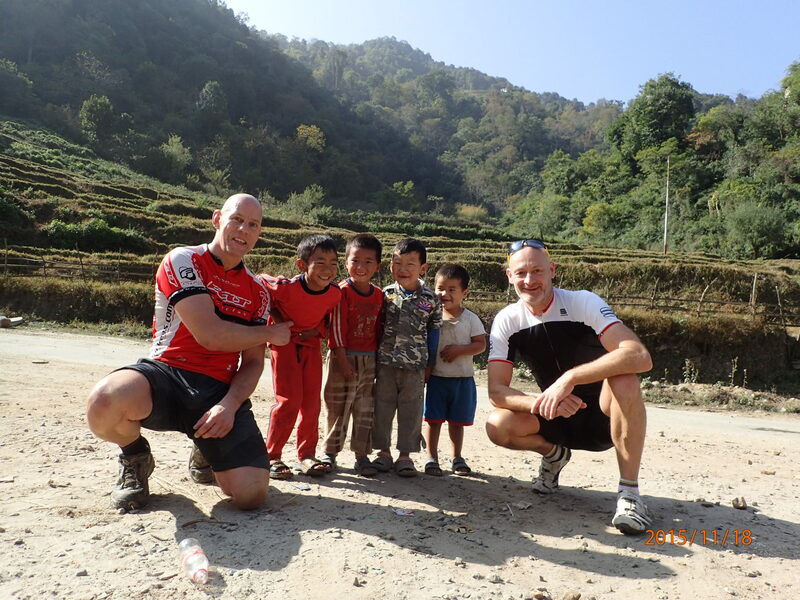 After breakfast in Trongsa, ride to Yoethongla pass on a long climb of 26 km. Then ride down to Chumey valley on a 20 km downhill section. 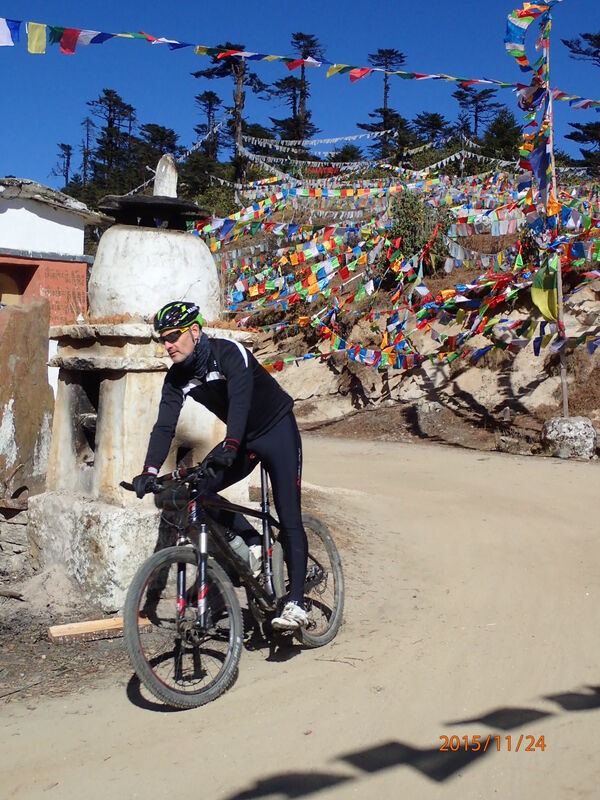 Take a detour to Tharpaling Goenpa on a 12 km climb on dirt roads, with an altitude gain of 1000m. The monastery is at 3600m. After lunch at the temple, ride on one of our favourite MTB singletrack trails that starts from the temple and stretches for 15km through alpine and temperate forests to reach Kikila in Chamkhar. Monal Pheasants are often sighted on this section. From Kikila, ride to your resort for another 12 km through Chamkhar town. Bumthang is as a truly amazing ancient place and today we will take some time to explore the old town and the beautiful valley on our bikes. 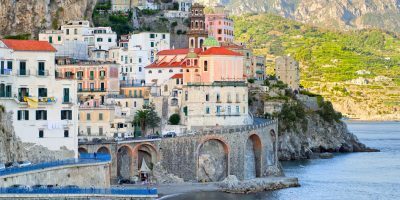 We will have the back up van with us, but, as one function of today is as a rest day, those who prefer can rest in the hotel and explore the town on foot. Options for today include visiting the Jakar Dzong, which literally means “The Fort of the White Bird”; Lamey Goemba, a beautiful royal mansion and monastery built in 19th century; and not to be missed is the Jambay Lhakhang, revered as one of the oldest temples in Bhutan. It is one of the 108 temples said to have been miraculously built in one night by the Tibetan king Srongsen Gampo to pin down a demoness. This temple was built to hold down her knee, while the Kichu Lakhang, which we will see in Paro, holds down her left foot. The central figure in the sanctuary is the statue of Jampa (or Maitreya), the Buddha of the future, after whom the temple is named. There are also three stone steps inside believed to represent past, present and future, which are slowly sinking into the ground. It is said that when all the steps disappear the future Buddha will arrive and we will all gather in Bumthang Valley to receive his teachings. We can also visit the Mebar tsho (literally means “Burning Lake”), a short distance up the road leading to the Tang Valley. 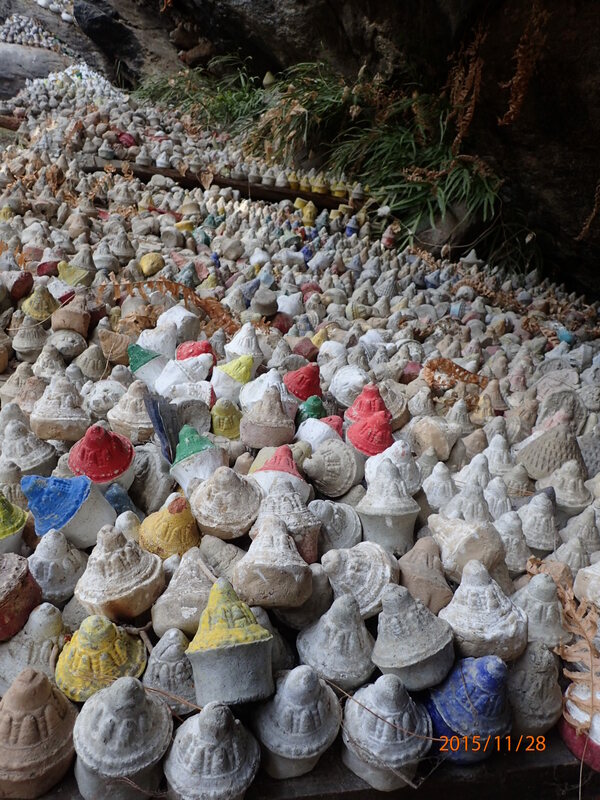 According to the legend, Pema Lingpa is believed to have retrieved several of Guru Rinpoche’s hidden treasures (Terma) from the lake. Mebar Tsho derives its name from the fact that Pema Lingpa submerged himself into the lake holding a butter lamp and on emerging from the lake, the lamp was said to be still burning. After breakfast we have a great ride up to the beautiful valley of Ura, the last and also the highest valley in Central Bhutan. The road climbs through amazingly open countryside, occasionally running through forests. Large sheep pastures line the road and the route crosses 3,600 m high Ura La before descending into Ura by a long loop across fields and pastures. The rest of the day is for exploring fascinating Ura valley and village. Perched at an altitude of 3100m, Ura village has uniquely close-clustered houses which are quite unusual in Bhutan. 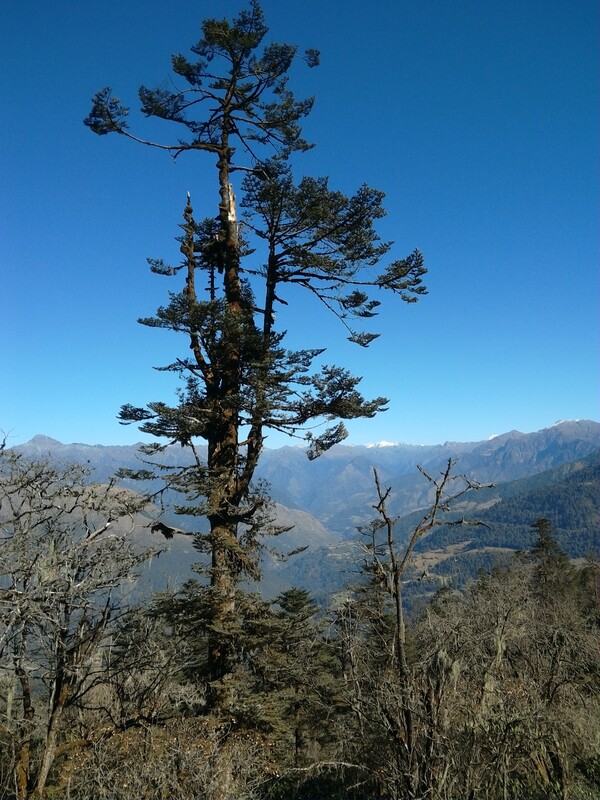 The valley is characterised by wide open spaces and it is stunningly located in the shadow of the Thrumshing La (3800m) which separates east from west in the Kingdom of Bhutan. 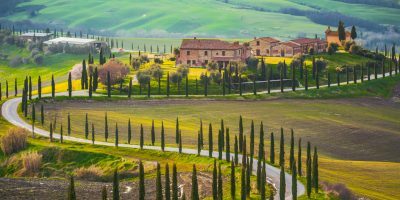 Ura village and its new monastery are a charming stop with cobbled streets and a medieval feel. The old women of Ura will steal your hearts; they still wear their sheepskin shawls on their backs which double as a blanket and cushion. 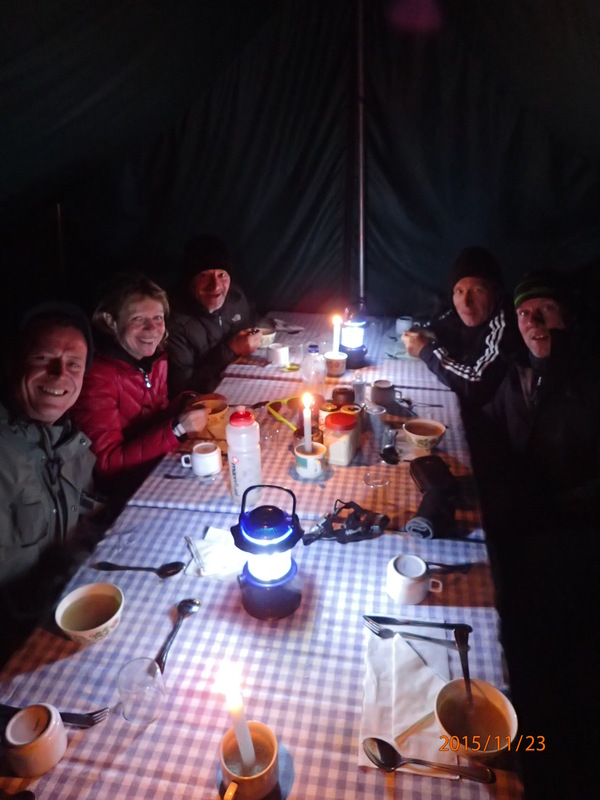 After lunch at Ura valley, we enter the Thrumshingla National Park and continue riding for another 20 km for about 2 hours for gradual ascents till you reach your campsite near Gyazamchu in a small wetland along the crystal clear mountain stream. The stretch after Ura to Gyazamchu is often rewarded by sightings of Himalayan Monal Pheasants by the roadside. After a nice breakfast at the campsite, continue riding on gradual ascents up to Thrumshingla pass at 3800m. 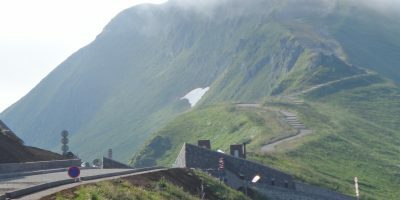 The ascent is about 15 km passing through old oak and Rhododendron forests with a mix of alpine forests. After the pass the road plunges down by 3200m and passes dark conifers, then a mixture of deciduous and conifer woodland, before entering the semi-tropical zone at an altitude of 1800 metres riding the longest descent of 87 km to Lingmithang. The road is narrow and the craggy with cliffs that drop for more than 500m down to the river. But it is ideal for bikes as this makes for an exciting adrenaline rush as you reach Lingmithang and our camp for the night. From Limithang, we have ‘a bit of downhill’ to where we reach our lowest point of 650m at the bridge over Kuru Chhu (river). The Chorten at this point was built in 1800 to hold the precious religious objects of Shongar Dzong when the Dzong was abandoned in favour of Mongar which we will pass through. Here we’ll visit, Mongar Dzong built at the beginning of 19th century. However, the present structure dates from 1953, when it was formed on command of Bhutan’s Third King, Jigme Dorji Wangchuck. Besides being the administrative centre of the region, it also houses the monastic community. We continue on our journey we cross the Kori La pass at 2400 m, marked by prayer flags waving in the wind and a chorten, before descending for some time through both forest and fields to Yadi. We then have the pleasure of riding down through the Yadi Loops, a series of figure 8 switchbacks taking us right down to the bottom of the Sherichhu valley. Our final destination for today and our entire ride is Trashigang, the largest district in Bhutan and also a substantial town, a central marketplace providing supplies to the remote outlying areas. In the evening we will celebrate reaching the ‘end of the road’, having crossed into Eastern Bhutan travelling over 550 kms by cycle, with quite a few tales to tell. This morning it is worth it to make a visit is the Trashigang Dzong, originally constructed in 1659, overlooking the Gamri River a sharp 400m below. The Dzong plays an important role in the local culture, hosting festivals, rituals and showcasing handicrafts and art. After damage and deterioration to the Dzong, renovation works were undertaken to restore it to its former glory. After exploring the Dzong, we start riding back to Mongar as this stretch is a really beautiful part of the trip. The climb from Serichhu to Yadi for 17 km is on hairpin bends passing through chirpine forests. Riders who do not want to ride back the same way can also choose to drive back in the bus. Day 11 – Drive to Bumthang to then catch the flight to Paro the next day. Drive back to Bumthang for 190km to Bumthang. Guests can choose to ride from Ura to Bumthang if they want. This is the last day of riding, therefore we need to pack up all the bikes for transportion to Paro in order to catch your flight to Kathmandu the next day. Enjoy a hot-stone bath – a complimentary value-added service from our side to help you ease the muscles and soothe the body and mind. After a leisurely morning in Bumthang town, fly to Paro in the afternoon. Tonight is our last dinner in Bhutan, and we savour the incredible flavours of chilli and cheese that Bhutan is so famous for. This morning after breakfast, you are free until it is time to transfer to the airport for your homeward flight. We will take you to airport where we bid each other farewell after a great experience in Bhutan! Please note – the B Class hotels are Bhutan’s entry level accommodation. A Class, while not the top of the range (which can cost up to US$2000/night) are very comfortable, for an example, please see www.hotelmigmar.bt.